The most critical – but least appreciated – part of any IT admin’s job has to be data backup. Nobody notices when you do it right, but everyone hates you if you do it wrong. Few people understand the skill and experience required to keep critical business data protected. Too often, people just assume that it’s just a matter of copying files to a tape and sending it away. But you know better than that. For example, there are a number of critical business requirements which must be accounted for as part of every backup plan. Probably the most important of these has to do with the long-term retention and protection of business data. Since it would be impractical and far too expensive to simply create a new backup every day, most IT admins only keep a small number of backups on file. Usually, 7 or 30 days worth. After making 30 daily backups on 30 different backup tapes, the oldest one will then be wiped out and recycled as the most recent backup. From here, the cycle continues forever. This system is usually called “first-in-first-out” (FIFO), because the first tape used is also the first tape to be erased. But what happens if you need to store data for a long time? Like maybe 7 years worth? That would require the purchase, storage and maintenance of over 2500 storage devices. Definitely not practical! So what’s another alternative? Well, since we know that data usually becomes less critical over time, we can strategically assign more frequent backups to the most critical data, while backing up less critical data less frequently. This isn’t a perfect approach, but it’s one that balances risk and practicality well enough for most organization. 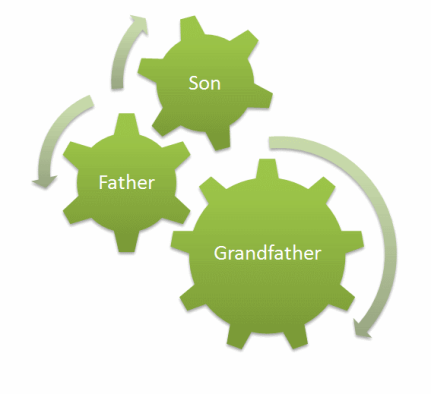 In order to achieve this kind of a result, many companies will employ the Grandfather-Father-Son paradigm. With GFS, you usually have 3 generations of FIFO backup cycles. It’s only practical for scheduled backups, and doesn’t permit continuous backup. It requires loosening of adherence to retention policies. This can cause problems in a lawsuit. The recovery process can be complicated. Recovery speeds can be slow with this methodology, depending on the method used for capturing incremental changes. This method often requires long backup windows. GFS backups require lots of manual handling. When recovering older data, this method offers poor granularity. There is another, more effective methodology that’s growing in popularity. It’s called the “Progressive Paradigm”. With the Progressive Paradigm, you can efficiently store daily backups for a long time while maintaining shorter backup windows, more efficient storage use, better security and faster recovery speeds. And best of all, it’s fully automated! We can talk more about the Progressive Paradigm in another article. But for now, the GFS rotation should be a very simple way for you to efficiently maintain long-term backups without making any major changes to your current data protection process. This guest article was written and submitted by: Storagepipe, a world-leader when it comes to corporate online backup. That gave me a good insight into Grandfather-Father-Son methodology and it’s disadvantanges. I will wait for your article on Progressive Paradigm.